Under the city of Rome lies a vast system of catacombs. The ancient Romans built these catacombs because they feared death and didn’t want to think about it. They wanted to push death out onto the margins, out of sight, deep beneath the city. These catacombs played an interesting role in the history of Christianity. In the first few centuries after Christ, Christianity was at odds with the empire and Christians were marginalized, ostracized, and persecuted. Despite the opposition they faced, they found that they could worship freely in the catacombs. The Romans wouldn’t go down there, but would send slaves to dig out the catacombs and bury their dead. So, the Christians were relatively free to worship there. They even sometimes built seats into the walls of these catacombs and also left behind paintings on the walls. This early Christian hymn goes on to say that “the day falls quiet and we see the evening light.” Can you see it in your mind? 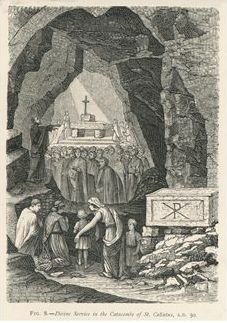 The Christians are gathering; they have a light in the catacombs; and they gather around the light to worship together and to sing their hymns of praise. Another epitaph belongs to someone named Domitilla. 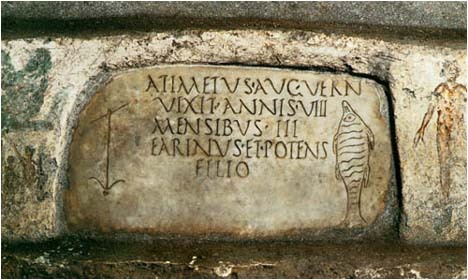 It says, “Who believed in Jesus Christ, together with the Father, the Son, and the Holy Spirit.” Many of these early catacomb epitaphs reference the Christian belief in the Trinity. It shows how important that doctrine was to the early church. Another of these epitaphs reads, “Here I rest, free from all anxiety, what I awaited has happened; when the coming of Christ occurs I shall rise in peace.” This is a wonderful testimony to resting in Christ. One of these epitaphs addresses the person directly. Her name was Aproniana, and she was only five years and five months old when she died. Her epitaph says, “Aproniana you believed in God, you will live in Christ.” This is a beautiful testimony to the hope of our salvation and the eternal life that we have in Christ. These epitaphs provide a beautiful witness to the lives and beliefs of early Christians. Isaiah 26:19 — But your dead will live, Lord; their bodies will rise— let those who dwell in the dust wake up and shout for joy— your dew is like the dew of the morning; the earth will give birth to her dead. Daniel 12:2, 13 — Multitudes who sleep in the dust of the earth will awake: some to everlasting life, others to shame and everlasting contempt… As for you, go your way till the end. You will rest, and then at the end of the days you will rise to receive your allotted inheritance. We give back to you, O God, those whom you gave to us. You did not lose them when you gave them to us, and we do not lose them by their return to you. Your dear Son has taught us that life is eternal and love cannot die. So death is only an horizon, and an horizon is only the limit of our sight. Open our eyes to see more clearly, and draw us closer to you, and then we may be nearer to our loved ones who are with you. You have told us that you are preparing a place for us. Prepare us also for that happy place, that where you are, we also may be; O dear Lord of life and death. Amen.